Posted on November 20, 2010 by Akashic Love & Light! In honor of the upcoming 2011 Iditarod; a grueling dog sled race covering over 1100 miles of the rugged Alaskan terrain, I decided to write about the world’s best dog sled vacations. The best (and cutest dogs) can be found in Iceland, Greenland, Finland and Alaska. Learn the art of dog sledding from expert Iditarod musher Sebastian Schnülle; owner of Blue Kennels. Sebastian offers an 8-day musher course guaranteed to test the limits of your endurance! Highlights from Sebastian’s long list of achievements are: 2009 Winner of the Yukon Quest; a grueling race that covers over 1000 miles of trails from Whitehorse in the Yukon to Fairbanks, Alaska, 2nd place in the 2009 Iditarod, and winner of the 2007 and 2010 Humanitarian Award for the best cared for dog sled team. Sebastian along with Iditarod musher Jessie Royer, leads an eight-day mushers training course and dog sled excursion where participants will learn how to drive their very own team of sled dogs. Mushers-in-training will also learn proper care and feeding of the dogs as well as learn how to endure the grueling conditions experienced out on the trail and during a race. There is no classroom instruction in this course! Trainees will learn in the rugged outdoor setting of the Alaskan wilderness while managing a team of 4-6 sled dogs. Upon successful completion of the week guests will receive a musher certificate and a photo with a lead dog. The tours are offered during the winter season generally from November 15th through April 21st. All lodging, camping supplies, food, equipment and transportation is included. In the summer, Blue Kennels in cooperation with Coastal Helicopters offers an amazing tour in Juneau Alaska. Small groups of six are taken by scenic helicopter over the Juneau Icefield to the magnificent Herbert Glacier. Once on the glacier visitors will get to meet and hear stories from Iditarod experts Matt Giblin, Jake Berkowitz and Sebastian Schnuelle. The trip would not be complete without a visit to the kennel to meet with over 80 adorable Alaskan Huskies. Afterwards depart on a special dog sled adventure driven by an Iditarod musher over the Herbert Glacier. All warm weather gear and transportation is provided. One important factor to consider when deciding where to learn dog sledding is the relationship the mushers have with their dogs. You can tell Sebastian really cares for and loves his sled dogs. One key component in training future mushers is how to properly take care of the dogs and he takes this piece very seriously. 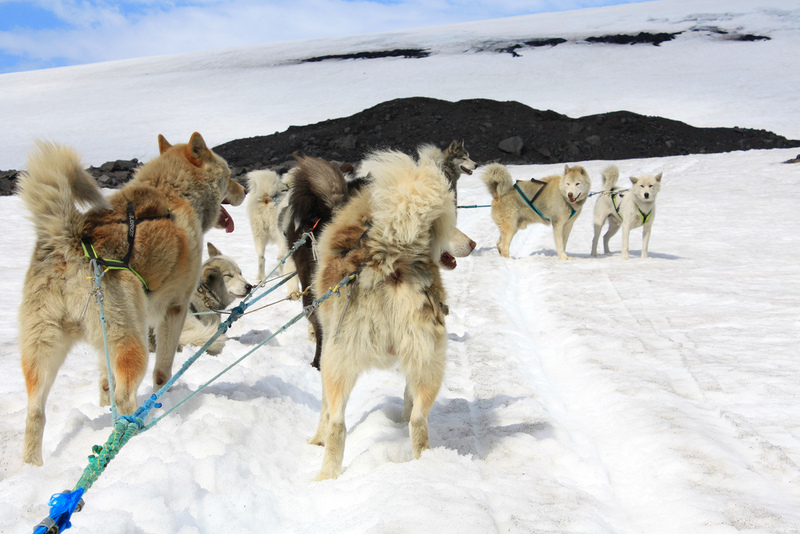 What could be more exciting than dog sledding on a volcano in Iceland? Eskimos offers exciting day trips from Reykjavik to the Myrdalsjökull glacier located on the same range as Eyafjallajökull; the volcano that shut down European air traffic for weeks with a massive ash cloud. The volcano has stopped erupting, but tours are offered on Langjökull glacier as an alternate location. The adventure begins with a scenic drive through southern Iceland via Super Jeep 4×4; this rugged truck equipped with a snorkel is needed to navigate the icy and sometimes flooded trails leading up to the glacier. Once at the tour headquarters participants are outfitted with warm snowsuits; as the temperature drops significantly once on the glacier. Finally the group is transported higher up onto Myrdalsjökull to meet the furry tour guides. Anxiously waiting at the camp are a team of 12 Greenlandic Huskies; these purebred huskies are friendly but tough dogs, bred to withstand the extreme conditions of the long Icelandic winters. Once onboard the long wooden sled, passengers get to enjoy the view as the two mushers skijor (ski) alongside the sled yelling out the commands; Hike to go forward or Whoa to slow down. Don’t be surprised when the excited huskies pick up some speed! To put the brakes on these wild huskies the musher throws a set of ropes over the front of the sled. If that doesn’t work (it usually doesn’t) they may have to jump onto the front of the sled; the added weight will eventually slow them down. After the ride the best part is meeting and petting each of the dogs. For those looking for a shorter adventure this is a good introduction to the sport of dog sledding. Home to the world’s second largest ice sheet; Greenland is a beautiful arctic refuge where the population of huskies actually outweighs that of the human population. For a truly amazing adventure visit the remote village of Tasiilaq Greenland, also referred to as Ammasallik. This tiny village just south of the Arctic circle, is characterized by its brightly colored wooden houses surrounded by a horseshoe of snow-capped mountains. Dog sledding is not just a fun sport in the hunting and fishing village of Tasiilaq but a much needed method of transportation during the extreme conditions in the winter. What better way to check out the snowy landscape of Tasiilaq than by dog sled? Become a licensed dog musher by completing a two day course guaranteed to teach you everything you need to know to drive your very own team of 6-8 huskies through the snowy tundra. Once licensed your skills will be put to the test with a camping and dog sledding expedition to the outskirts of the region; Ammasalik island. Tour arrangements can be made through Destination East Greenland. Become immersed in the world of dog sledding at the Eräkeskus Wilderness Lodge & Huskyfarm; situated in North Carelia, Eastern Finland. Visit the on-site husky farm that houses two large kennels that includes 123 Siberian Huskies, Alaskan Huskies and Scandinavian Hounds. Guests will have fun visiting with this large pack including the adorable husky puppies, adult sled dogs and house dogs. Many different tour options are available to fit all activity levels from beginner to extremely challenging. Beginners should try the Peaceful Christmas and New Year in Eräkeskus tour. This eight-day adventure includes everything; airport pick-up, lodging in Eräkeskus, all food, and dog sled instruction. Mushers-in-training start with a visit to the kennels to learn about proper care of the sled dogs, then onto the basics of mushing including: Commands, how to hook up the sleds, how to harness the dogs and care on the trail. Once the instruction is complete the fun starts with a two-day overnight sled dog adventure to a wilderness cabin. Participants will load up the sleds, ration the food for both the pups and mushers, hook up sleds and harness the dogs. Finally each person will learn to drive the sled of 4-6 huskies. Another day is devoted to a snowshoe-hiking excursion in the Koli National Park. Enjoy hiking in the beautiful mountain scenery and along the way stop for lunch cooked on an open fire in a Finnish wind-shelter. Those looking for more of a challenge should sign up for the Eräkeskus Border-Trail which covers distances up to 70 km per day. Dog sledding captures the very essence of adventure travel. Whether the goal is to take a fun tour or to become a certified dog musher; a visit to one of these arctic wonderlands promises the adventure of a lifetime. This entry was posted in Arctic and tagged Alaska, Denali Highway, dog sled, dogsledding, Fairbanks Alaska, iceland, iditarod, Iditarod Trail Sled Dog Race, mush, Whitehorse Yukon. Bookmark the permalink.